Managing Director Bradley Cannings is pictured with his son Ed, the third generation of the family to work within the company. Serving up a delicious slice of swimming pool design, with a dollop of hot tub retail on the side, H2O have hit upon the perfect blend of ingredients within the water leisure industry. A trading arm of I.J Cannings & Son, H2O specialises in pools and spas and just about everything that falls in between. The H2O team has recently completed a wellness suite at Cary Arms boutique hotel in Devon featuring a large hydrotherapy pool. The team is also working on several commercial projects for a hotel chain in Sidmouth, including the complete rebuild of indoor and outdoor pools and a brand new wellness suite. “This year we have built subterranean pools, indoor hotel pools, outdoor commercial and domestic pools, as well as installing steam rooms, a few saunas and wellness pools,” says Dan.“We have refurbished decrepit pools and we are even are in the planning stages of building a pool fi ve storeys above the city. There really is no limit to our specialisms,” he adds. Established as a building company in 1969 by Ian Cannings, I.J Cannings & Son went on to manage many national accounts while keeping their roots fi rmly planted in Exeter. Swimming pools was an area that the company was constantly drawn to, as was the rising interest in spa baths. 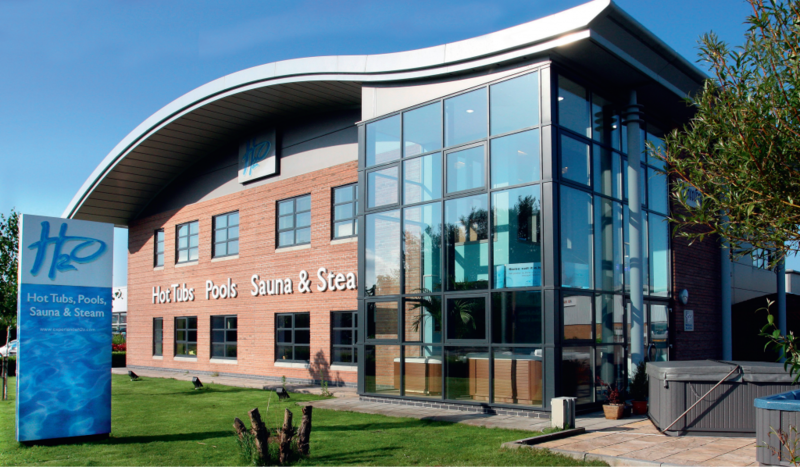 Prior to the turn of the millennium, Ian’s son Bradley was already managing many facets of the company and it was at this time that Bradley first penned the plans for a dedicated pool and hot tub showroom; the first of its kind in the west country. Now nearly 20 years later H2O, the retail face of I.J Cannings & Son is one of the longest standing pool and spa companies in the region. Says Dan: “One of the things I love about the southwest is that our clients are from all walks of life; diverse is an understatement.“Our pool clients tend to be more affluent but we also have many above ground pool clients. The company is headed up by Bradley Cannings who is supported in his role as Managing Director by General Manager Mark Harris and Sales and Marketing Manager Dan Johnson. Damian Vittles is the Pool Project Manager and Dave Boulton is the Lead Hot Tub Engineer, while the showrooms in Taunton and Plymouth are managed by Troy Godfrey and Niall Hunt respectively. Bradley’s son Ed Cannings is the third generation of the family to join the business and is currently working through college whilst working within the H2O division. “As part of a large building services company we are able to bring to bear a significant skills base,” explains Dan. He continues: “From plumbers to gas engineers and from installing power cables to laying a concrete base – there is nothing that we need outsource. In the short term, H2O’s goal is to keep pace with the rapid growth it has experienced in 2015 and 2016, through continuous staff training, enrolment and business investment. Longer term, the company hopes to consolidate its position as a market leader in the Southwest region, while also expanding the Plymouth and Taunton showrooms.